This is a very scenic area for cross country skiing and snow shoeing. The trails are wooded with a mix of hardwoods and conifers. An easy trail winds along a scenic stream leading to the northern terminus of the trails. In between are ranges of easy to moderate, then more difficult and advanced terrain. The area is open to the public at no charge. The novice trails and many intermediate trails are rake-groomed, but not on a daily basis, so conditions may vary depending on weather and snowfall. Most trails are well shaded by evergreens. Be prepared for difficult trail conditions when snow cover is thawed and refrozen and after any rain that has refrozen. There can be areas of washout after rains. 204th Way is the main trail running through the middle of the trail network, from which most side trails can be accessed. The trails that climb on the slope to the west of 204th Way are mostly hardwood forest with more sun and are narrower than the trails to the east of 204th Way. Trail names are from characters and places in James Fenimore Cooper’s “Last of the Mohicans”. 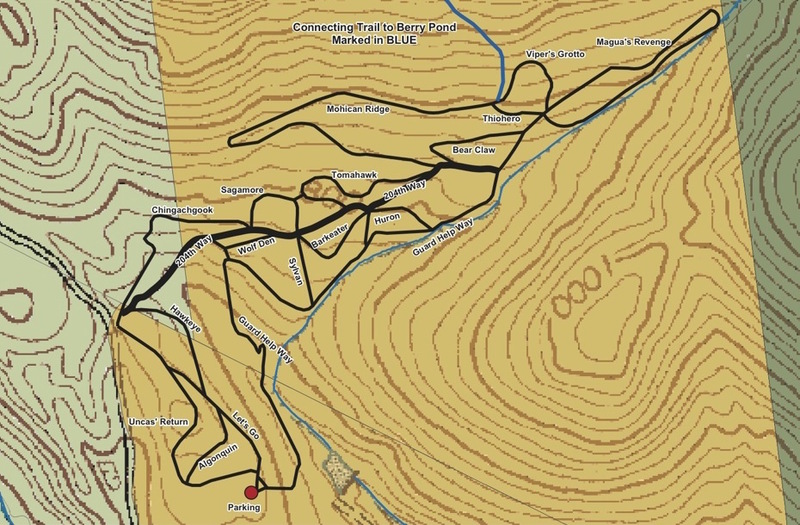 Two trails are named for the New York Army National Guard’s 204th Engineer Battalion which was involved in clearing the trails.